Please post any suggestions you have to improve Marspedia using this section. We're in the process of upgrading the wiki and redesigning the main page. You may see things change a bit over the next few weeks & months. Currently the wiki is using Public Domain content in the main namespace, with sub-namespaces for GNU Free Documentation License and Creative Commons (non-specific). These were set up in 2007 when the wiki was created. There is some interest in changing the main namespace to Creative Commons' Attribution-ShareAlike 3.0 Unported License, which would make Marspedia compatible with Wikipedia and allow us to share articles. Recently, I added the Mars 2020 article, and added some of my thoughts on this to the Talk:Mars_2020 page. All public domain/CC0 content is compatible with Wikipedia. Changing the terms to something more restrictive not only is arguably claiming ownership of content submitted to be public domain, it would also create incompatibility with its sister wikis such as Lunarpedia. We were able to stop the torrent of spam users & content that is created daily by botnets, and did a large amount of cleanup of spam users and pages they created. There were over 12k users in the system as of the end of September when we were finally able to stop the torrent using a combination of configurations & plugins. If you signed up for a new account in the last couple of weeks, it's possible we assumed you were a spammer and removed you. If this happened to you, please let me know immediately by adding to my talk page or sending me an email. I was able to configure a new Visual Editor for this wiki using an experimental plugin that runs on a Node.JS application using Heroku. This should make the wiki easier to maintain, especially for non-technical users that don't want to learn the Mediawiki codes. Also I have added some of the newer options & extensions available in Mediawiki such as RemexHtml Parser, CiteThisPage, and ensuring things like ParserFunctions and ImageMap are working. 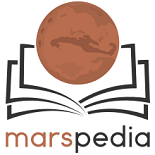 Marspedia is currently using an older version of the standard Mediawiki skin "Monobook". We have an interest in upgrading to the more recent "Vector" skin as this would make the site more accessible to modern mobile devices. We also would like to think holistically about the design of the wiki and the main page & what calls to action are needed. I have made an attempt to upgrade the front page to improve design, ease of use and accessability to the wiki. I have tried to focus on accessibility for new users as we need to increase online interest in our efforts. Inclusion of a "Featured articles" on the front page (see user:Ioneill for development details). Creating Marspedia:About page to move bulk text from main page. Creating "Marspedia News" section on front page - for development purposes (i.e. new site developments/announcements), not to advertise new content. Copyright notice, should it be moved to a less-prominent position? Cool, glad to get people's opinion on it. Kinda melded the Wikipedia format with our own - hopefully we'll be a unique set of wikis in time. I've been looking at the copyright notice, and I think we can work with what we have for now. We must keep in mind, we are in the development phase of this project, so there are going to be a lot of rough edges. As we will (hopefully) have a continuous, and increasing influx of articles, newcomers will need to read the GFDL terms and conditions first. Also, having the copyright notice there is in keeping with Lunarpedia etc., so it's a good visual aid to see we are all in the same "club"! James, feel free to copy any of the design aspects and stick them into Lunarpedia, will be nice to see a cool blue and grey version 8) I think the divs and tables are up to par. Seems to be formatted correctly in Firefox and IE, so there shouldn't be too many issues with other operating systems. I've noticed a slight loss in border on the right side of the copyright notice when using FF, will get that fixed. The previous Captcha has been removed. Please report any problems with the newer set of extensions. So far they are preventing ALL spam. Your activity is close to us on spirit, we are glad to your successes. We invite you to discuss the new practical idea of association in the unique program of which the mankind didn't know analogues. The given program has the working name «Otherwise continent» (in Russian - «Иной континент»). Idea being: to begin in different places of the Earth creation of real planetary settlements, pertinent for conditions of the Moon, Mars, etc. and to offer in this independent settlements habitation and work for high-grade intelligent families. It will allow to provide advancing development of new land culture and an infrastructure of interplanetary programs which shortly all the same become habitual for earth dwellers. I.e. we begin preventive preparation to grow roots on the planets through inclusion of such independent planetary settlements in a land economic turn, developing thus empty earths, applying renewed energy sources, progressive agrotechnologies, «new pedagogics» and many other innovations which still remain a rarity on the Earth. I.e. for planetonautics priorities vary into how socio-culture drive technology’s development: socio-culture factors become a source of technological development, rather the reverse, as before, in astronautics, for example. The program is supported by some companies and the research centers of Russia, now we search for partners in a consortium abroad. Their interest is clear: after all in the conditions of crisis such strategy will allow to open new applications for pertinent workings out from any of areas – the industries, astronautics, IT, social technologies, the pedagogic, robotics, transport, the different high technologies, many branches of fundamental and applied science etc., i.e. will suffice affairs on all. There will be new workplaces, families will not break up, new knowledge and technologies, social communications etc. All these workings out be required and inhabitants of independent settlements will be engaged, and superfluous products (energy, a foodstuff, new knowledge, techniques, etc.) will be on sale on a foreign market. We consider that the most suitable time has now come to pour in this strategy the large finance and to provide to it steady progress. Details it suggested to discuss after your acknowledgment of basic interest. The co-ordinator of the program "Independent planetary settlements"
This page was last edited on 17 November 2017, at 11:33.